Angel Orensanz Wedding Photography is taken in a space that celebrates art and culture every day of the year. 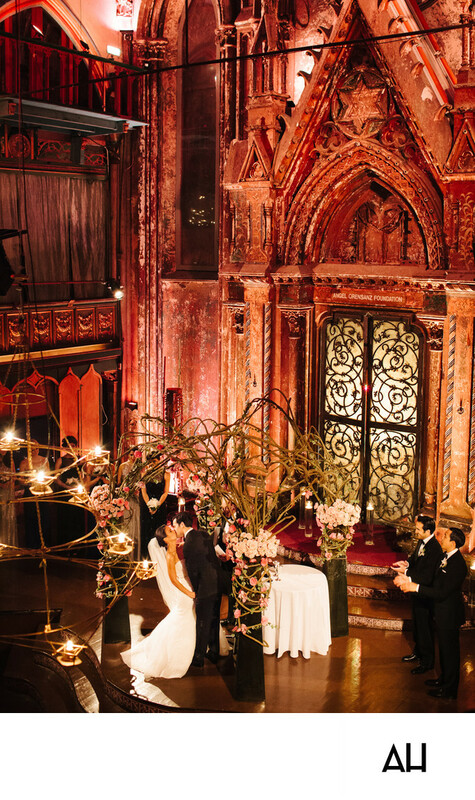 The venue, the Angel Orensanz Center, is reformed synagogue in the heart of New York City. The center was built in the the style of the Gothic Revival, also referred to as Victorian Gothic or Neo-Gothic. The Gothic Revival was an architectural movement that began in England in the late 1740s. Key features of the movement were drawn from the original Gothic style, including decorative patterns, finials, scalloping, lancet windows, hood mouldings, and label stops. Other architectural elements such as pointed arches, steep-sloping roofs, fancy carvings, and lattice work can also been seen in Gothic Revival works. The architectural mastery that can be seen in most Angel Orensanz Wedding Photography is on display in this photo. First though, the eye is drawn to the image of the bride and groom who have just said, “I do”. The couple share their first kiss as husband and wife beneath an archway of branches and flowers in varying shades of pink as the bridal party and guests applaud the newlyweds. Beyond the bride and groom, is another eye-catching scene -- the door of the synagogue. The iron work of the door is formed into an intricate, swirling design that allows light to filter through and gives the door a mystical glow. That glow seems to permeate the room and add a brightness to the red stain of the wood that encompasses the interior of the space. The woodwork is extremely detailed and fits the style of the Gothic Revival. The setting of the Angel Orensanz Center creates wedding photographs that are true works of art.